France Summer 2018 – Sunday Times Travel Guide – the most glamorous gites to rent! The Orangerie ref HE097B was mentioned in France 2018, Sunday Times Travel Guide. Read the Sean Newsom article on Holiday Gites going glam. If you want visual drama with your morning croissants, this is where to find it – 5 towering French windows and views of a 13th century chateau. 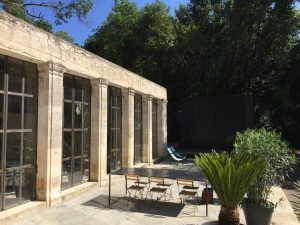 The Orangerie is the coolest part of the Occitania estate, near Beziers, and mixes sharp modern lines with rubble-stone walls and 12 ft potted plants. 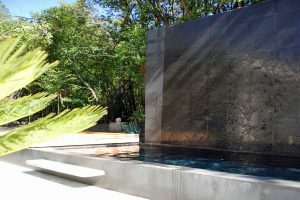 Outside, you’ll find a basalt plunge pool. 20 acres of parkland and a never-ending sense of “wow”. Delusions of grandeur are inevitable.